We require a prepayment of 30% of the total amount, 60 days prior to arrival. Outstanding amount should be paid at most 14 days before arrival. 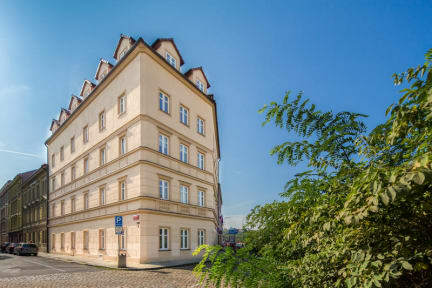 The concept of our hotel is that we provide small clean rooms with the basic services a hotel has to offer and in return we offer some of the lowest prices in Prague. 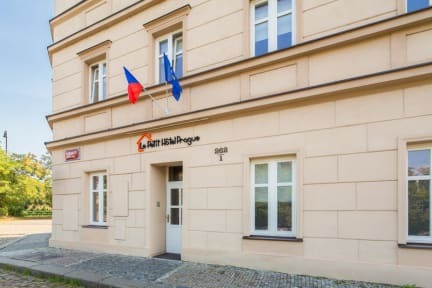 Le Petit Hotel Offers Budget accommodation near the centre of Prague and offers 24 hour Reception, rooms with private bathroom, luggage storage and a breakfast room where it serves a daily buffet breakfast. The building has a historical facade however is completely modern on the inside after recent renovation. The hotel is located directly in front of the Holesovice Tipsport Arena in Prague 7 district. 400 meters from the hotel you will find the main tram & bus stop which takes you into the old town within 12 minutes. Nadrazi Holesovice is also 400 meters away and can take you within 3 stops to the main Florenc Station. Le Petit Hotel Prague offers 82 rooms include a private bathroom with shower, hairdryer and towels which are changed on request. The hotel also offers a breakfast room to serve it’s guests each morning and luggage room to ensure guests have a comfortable stay. The fully functioning front desk also offers guests and option to buy transport tickets or transfer to the local airport. This property may pre-authorise your card before arrival or charge the total amount in case of non-refundable bookings. Breakfast costs 6 EUR/ person - upon the request.